Yesterday about this time, I was convinced I was about to be mauled by a pack of wild dogs on an isolated stretch of lonely highway. After a few warning growls and menacing barks, the dogs turned tail and settled into a clump of tall weeds in a culvert along the rural road. The dogs did end up playing a huge part in this shaggy dog tale, but I didn’t know it at the time. Under skies darkening with thre atening clouds, the day’s light weakened as the wind whipped my hair. I buried my cold, cranky hands in my jacket pockets and trudged along the road, heading away from the dogs and back toward the discarded piece of white plastic that had brought me to this cold and lonely place. I had been tromping up and down the road for hours. I was cold. I was hungry. The weather was getting worse, the hours getting later, and I couldn’t find what I had come here to find. The unplanned excursion was set in motion by a phone call I had received earlier in the day. My daughter, a college student in a distant town, was heading back to campus after holiday break. She was making the five-hour trek in her grandmother’s 1998 Nissan Altima. My husband was accompanying our daughter back and would hop a commuter flight home. A few hours after my travelers pulled out of the driveway, I got the call. 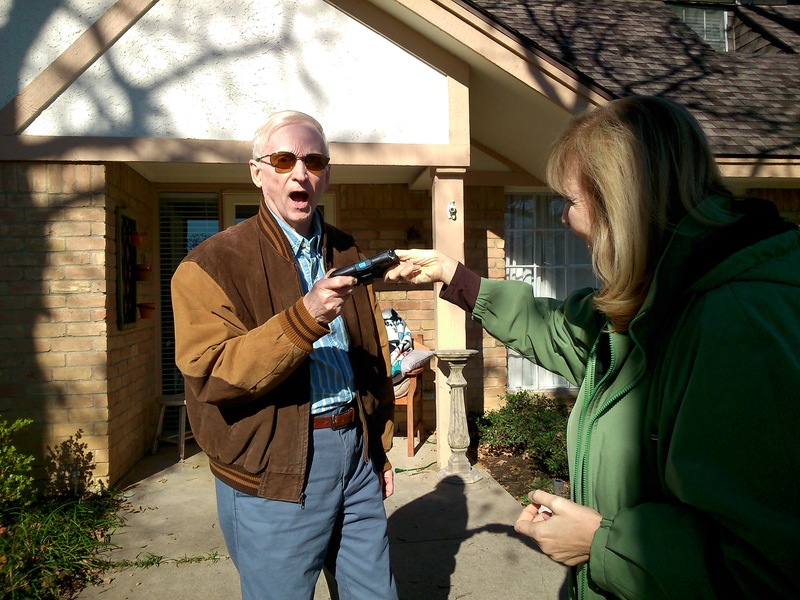 “We have a problem,” my husband blurted, his tone tense, his voice frantic. I held my breath. My heart pounded. I braced for bad news. Husband hurriedly explained that daughter had run over a large piece of plastic, and it had lodged under the car. They had pulled off the highway; my husband crawling on hands and knees under the vehicle to dislodge the plastic. The car was fine, they were fine, my husband explained, but during the melee’, his phone was missing. They hadn’t realized the phone had been left behind until they stopped for a rest break. Now, three hours into the trip, the phone was somewhere on a roadside, near a mangled piece of plastic that resembled a discarded antifreeze container. I forfeited my place in the pharmacy line, rushed to the phone store — and with the assistance of an employee and iCloud — found that the phone was somewhere along Chisolm Trail Parkway near the small town of Joshua, about 45 minutes from home. 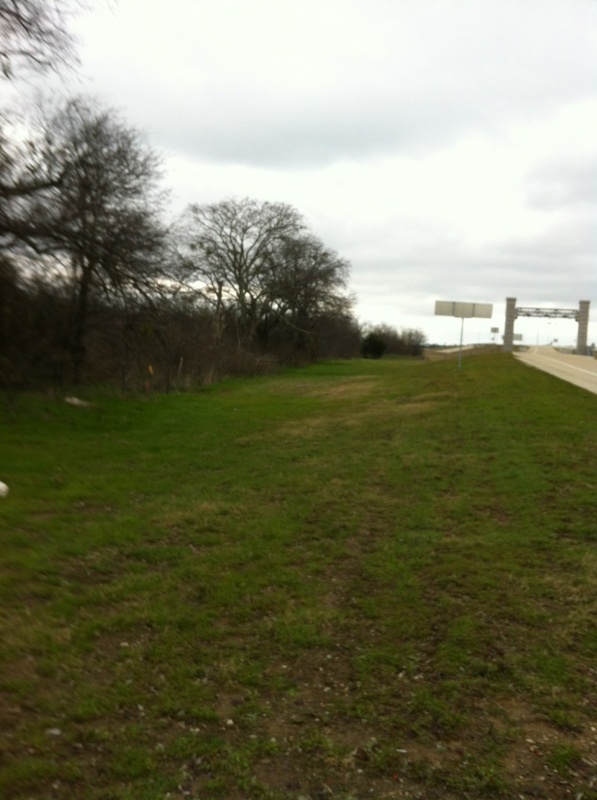 The green dot on the iCloud map indicated the phone was near Farm Road 904 on the service road shoulder, slightly south of the tollway cameras. It seemed simple enough. I’d hop in the car, head to Joshua, find the phone, and be back home before college kid slipped the key into her dorm room door. 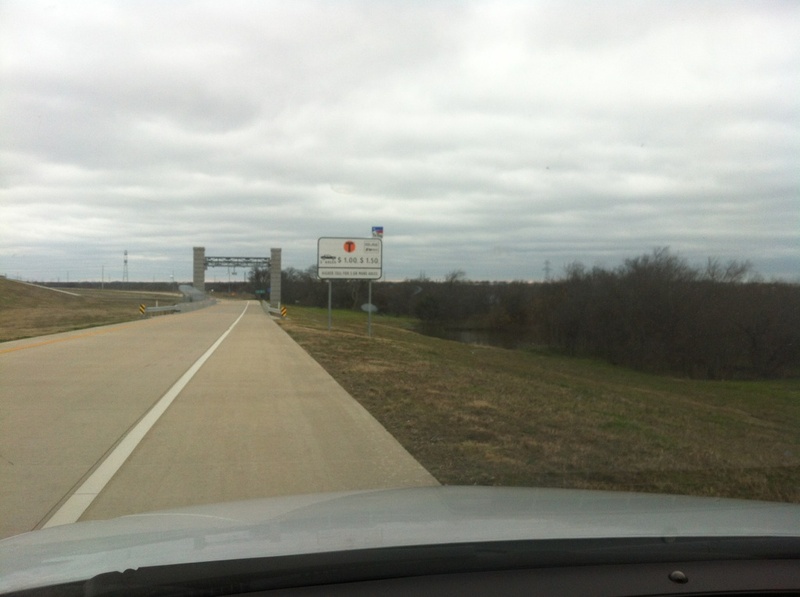 Blaring Sirius Classic Vinyl to keep me company, I took their same route, checked mile markers and found my exit. 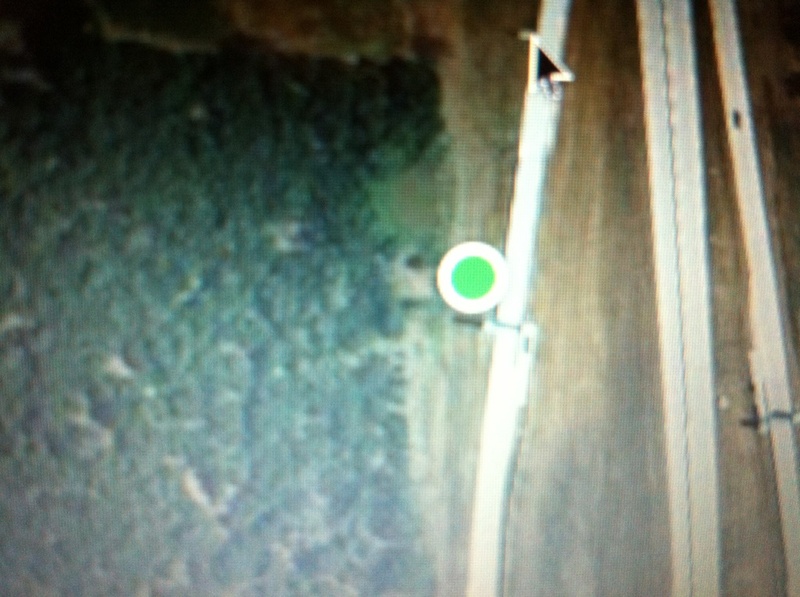 I eased off the road, close to where the iCloud dot indicated the phone should be. I parked, got out and scrutinized the area, looking for the phone, housed in its black, leather case. I soon located the plastic container that had set this whole scenario in motion, lodged in a clump of weeds along the fence line. I texted my husband the picture, and he confirmed this was the container that had delayed them and that I was in the right place. The phone should be there, somewhere near the edge of the road. Step by careful step, I searched, imagining myself like those forensics experts on TV crime dramas, combing small sections for small clues. I found a discarded Modelo bottle, a charred piece of wood, a Coke can and small pieces of trash — the usual highway flotsam. No phone. I kept looking. Kept walking. I called the phone repeatedly, listening keenly for the distinctive ring above the howling winds and rush of traffic. No phone. 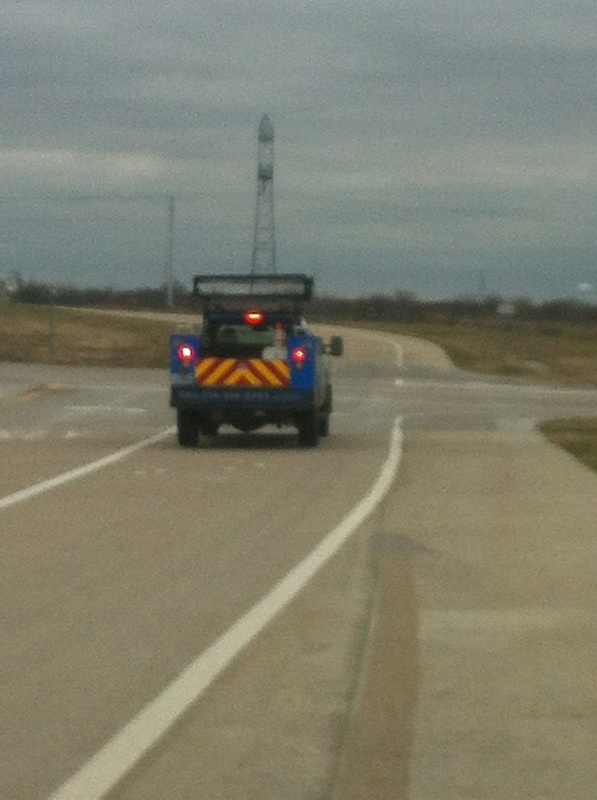 As I was warming up in my car, tollway security showed up. I explained my plight, and the men assisted in the search, the three of us fanning out in the area indicated by the iCloud dot. I checked again and the dot was there, right where we were searching. We were puzzled. We were in the right place, the signal was strong, and the phone should be easily visible. I called the number again, and we all listened for the tell-tale ring. No phone. The security Samaritans soon had more pressing roadside matters and bid me farewell. I resumed the search, fighting biting wind, my dwindling time, my rising frustration. 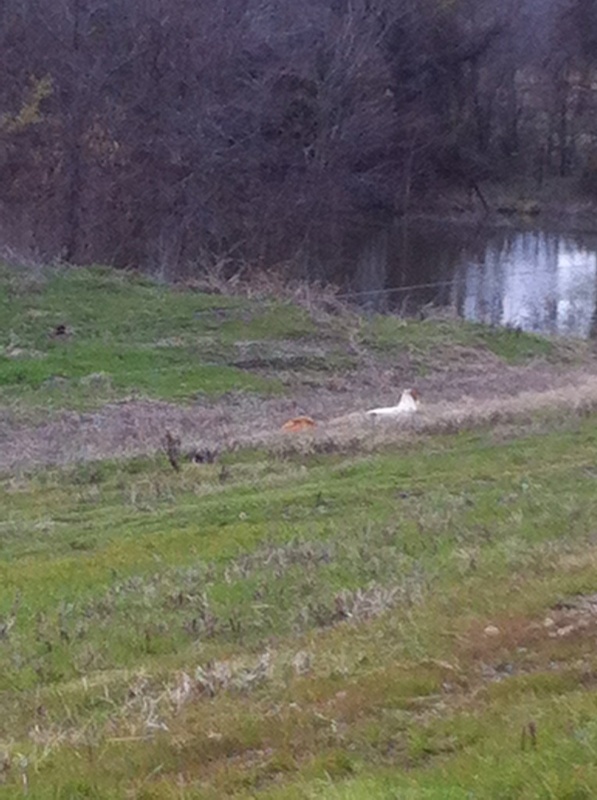 The dogs, hunkered down in the clumps of grass, watched from their roadside den, but didn’t bark or growl. Disappointed, empty-handed, I got in my car for the drive back. Later that evening, I checked iCloud, puzzled to see that the map dot had moved from its earlier location. It was still near the service road, still in the vicinity where I had been searching, but further south, closer to the tollbooth cameras. It didn’t make sense that the dot was moving. There were no homes in the area. No one had responded to the missing phone message I had added via iCloud. The battery was strong, the phone still on. I called the again and got my husband’s voice mail. I also called a tech-savvy friend and told him about the day’s adventures, asked his opinion. I shared my puzzlement that the phone seemed to be hiding in plain sight, and told him I was convinced that if I could have one more go at it, I could find it. I reasoned that if I could go back, I might be able to find the phone before the battery konked out. I had been a Girl Scout leader. My troop and I had earned the Geocaching badge! My friend offered to return with me in the morning. Perhaps the two of us could find it, he offered. Early this morning, we headed back to Joshua, iCloud indicating that the phone had moved yet again overnight. The phone was now, distinctly, on the other side of the toll cameras; north of where it had been the night before. We were perplexed, but determined, arriving roadside to sunny skies but a biting wind, scanty temperatures. We started our trek down the steep embankment, scanning for a smear of black against grass glistening with the dusting of a light overnight frost. After an hour or so, we got back in the truck to warm up, disappointed and disheartened that this might not end the way we hoped. We checked iCloud again. This time, we activated the “lost phone” signal and set out again, straining to hear the distinctive tone. We were farther from where we had started the morning’s search, but the dot indicated the phone was somewhere close to a small pond and a clump of trees, far from the roadway. The location where the plastic piece lay discarded was at least two football fields away. If the phone was lost on the shoulder, we were now a long way from the initial location — and that first map dot. We kept walking, searching and listening, when my friend abruptly stopped. I whipped the hood off my coat and strained to hear what he was hearing as he took huge strides across the grass to the fence line and a small stand of trees. I caught up with him and before I heard the distinctive, rhythmic ping. It was coming from the woods, away from the road, past the fence. “It’s in there,” my friend confirmed, gesturing to a thicket of trees. 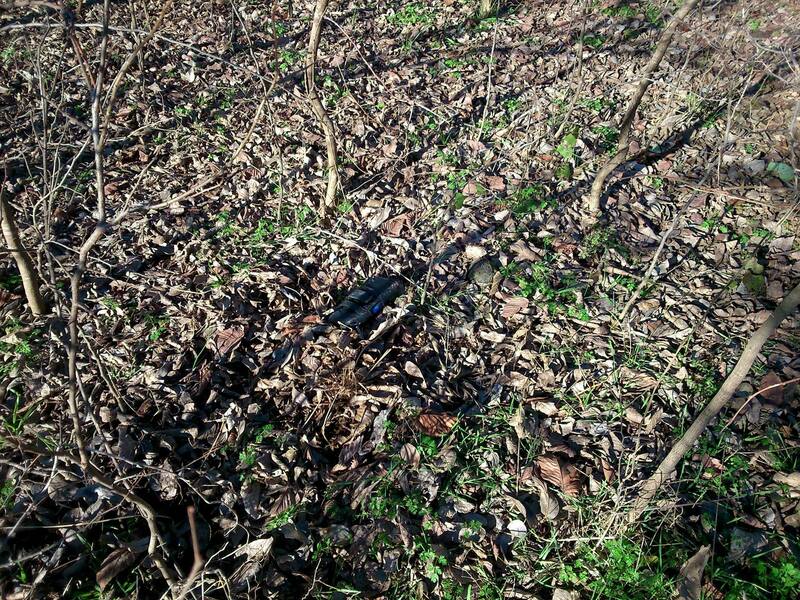 The area was overgrown, dense with underbrush and brambles. The sound was coming from the woods, beyond a barbed wire fence. “Should I go?,” my friend asked. 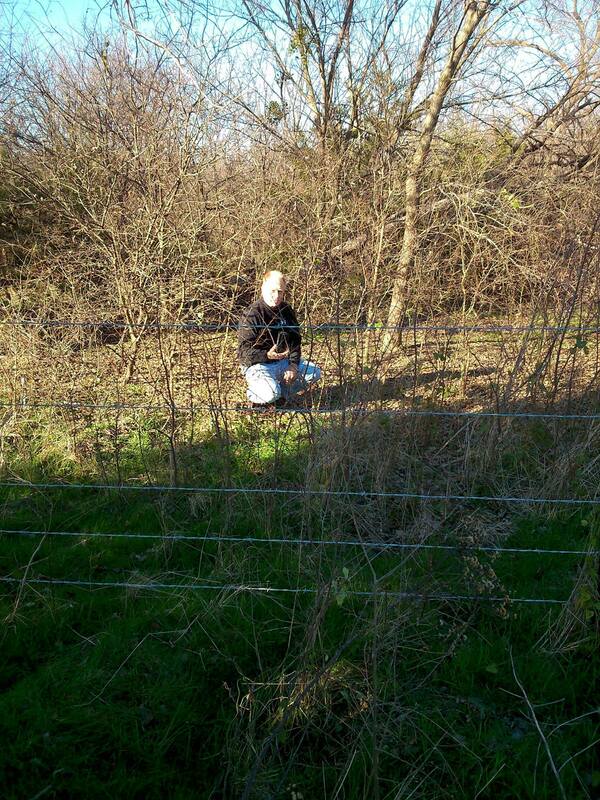 He hesitated slightly, bent down, and as I held down the bottom wire with my boot, he shimmed through the fence. 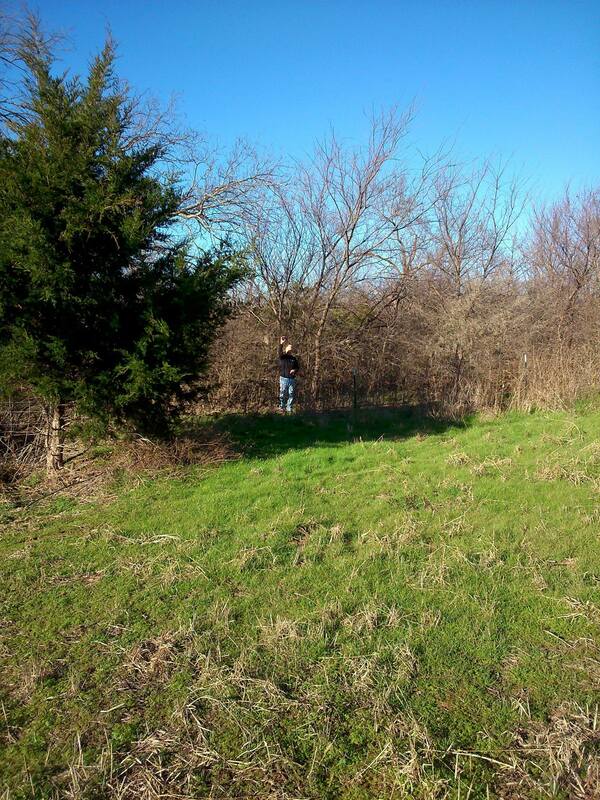 He disappeared into the thicket as I waited, listening to that rhythmic pinging. I got my own phone out and called my husband’s number. The woods rang with sound. In a few minutes, my friend was back, beaming, holding up a black leather phone case, triumphant. I helped him scramble back through the fence, and like gleeful children, we examined this prize we had worked so hard to find on this crazy, calculated, treasure hunt. The case was scuffed, weather-worn, slightly mangled, and tooth-marked. 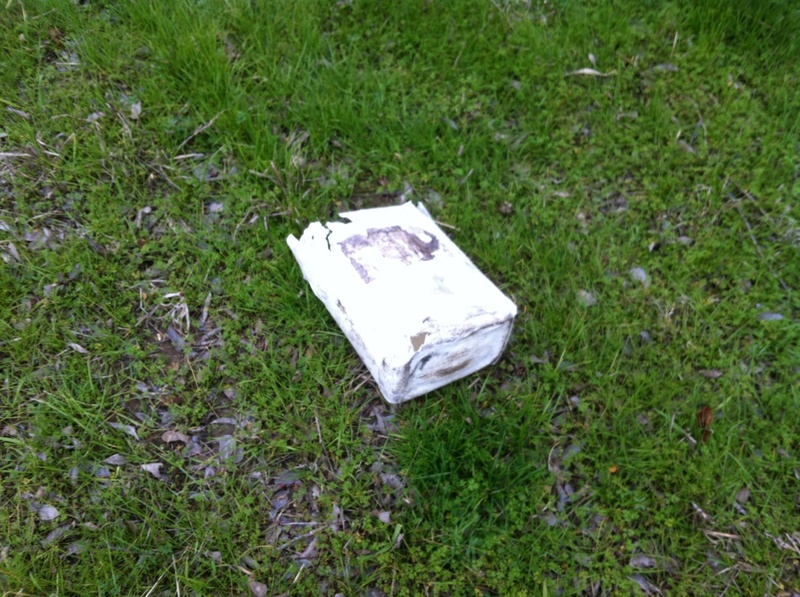 The dogs, who had barked warning the day before, had evidently found the phone alongside the road and taken it. When I first arrived, they already had the phone. The dogs had watched me in my frantic search, the phone safely hidden in their grassy lair. The map dot moved because the dogs were moving the phone, much like my Shepherd at home carries her prized toy from room to room and takes it with her to her crate. The dogs — or one of them — had nabbed the phone and were roaming with it. The map dot was moving because the phone was moving. I couldn’t find the phone because the dogs had it all along. We took the phone out of the tattered case, and I called my daughter at school. Though the case was worse for wear, the phone worked fine. “Oh, my goodness, you found Dad’s phone,” my excited daughter chirped. I relayed the strange story, told my daughter we’d surprise her Dad when he arrived from the return trip. My friend and I took a few final pictures of the woods were he had found the phone covered in a litter of leaves. The trip home didn’t seem to take as long. The wind had calmed, the sun was shining. We cranked up the heater and the radio and sang. The look on my husband’s face was priceless when we presented him with his well-traveled phone; showed him the screen shots of the moving map dots; pictures of the dark, dense place where his phone finally came to rest. My husband smiled and shook his head. I was almost mauled by a pack of wild dogs on an isolated stretch of lonely highway. This entry was posted in Friends, How to find a lost phone, Lost phones, true friends, Uncategorized, Wild dogs. Bookmark the permalink. I love that story! Those dogs were pranking you! LOL. The good part is that you found the phone. What an adventure! Wow what a story, thanks for sharing.. Thanks so much! It was a little crazy, but had a happy ending, at least! I am nothing if not stubborn and tenacious! 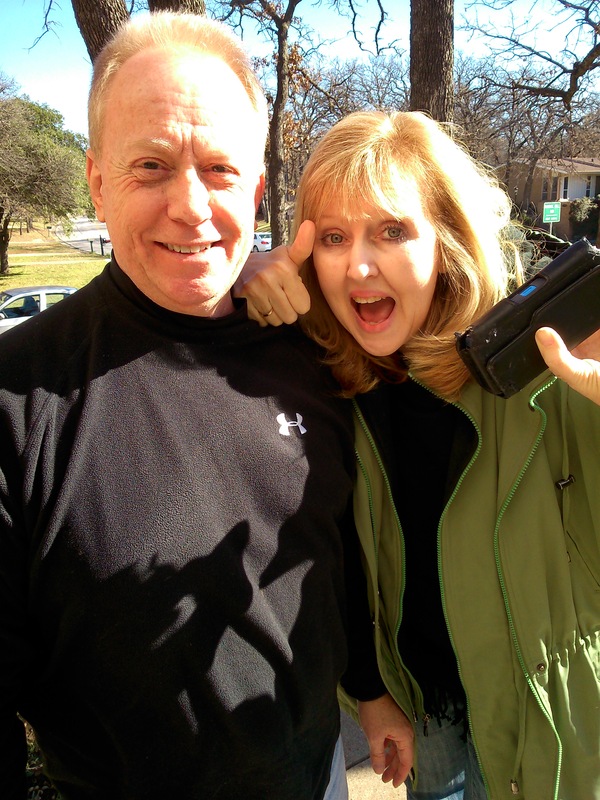 Took up my whole weekend, but you are right: thrilled to find hubby’s phone!